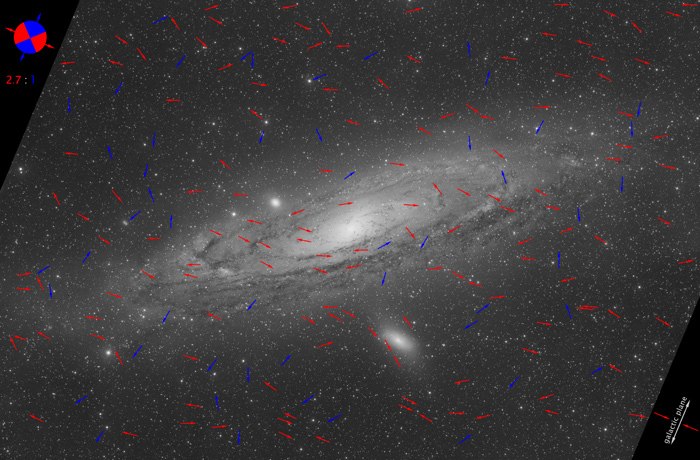 Star positions of my recent shot of the Andromeda galaxy are compared with those of the POSS1 sky survey taken in mid 1950's. It is well known that almost all stars move with fast speeds through the galaxy and relative to each other but due to their large distances this is hard to appreciate. Although the image resolution of my shot was only about 3.2" per pixel, careful scanning of the image revealed almost 200 stars that obviously changed their relative positions. This change in position is called "proper motion". The proper motion is the linear representation of the real motion of stars observed by us. Every arrow in the image is aligned approximately perpendicular to the motion of a star. Red arrows indicate star motion along the orientation of the galactical plane within a range of ± 45 degrees. The rough statistical analysis shows that just about 75% of all moving stars are within this range of the galactic plane. This might be reliable since the expected star motion should be larger parallel to the galaxy disk. Such a general trend of proper star motion was for example also found by C. Abad and K. Vieira (2005). They used to analyse more than 8000 stars catalogued by Hipparchos which were distributed all over the sky. 100% resolution crops with the overlayed POSS1 image, showing the actual star displacement can be found on the links below!